Gloucester pair Tavis Knoyle and Sila Puafisi have been banned after being sent off during Saturday's 18-17 Premiership defeat at home to Bath. A disciplinary hearing in London gave scrum-half Knoyle a four-week ban for striking Leroy Houston. Prop Puafisi received a one-week suspension after a dangerous tackle on Nick Abendanon. Both players pleaded guilty, with Puafisa free to play again on 22 April and Knoyle on 20 May. Knoyle's attack on Houston sparked a mass brawl following Bath's match-winning penalty try. Referee Tim Wigglesworth also sin-binned five players in a match which saw Gloucester reduced to 11 players by the end. 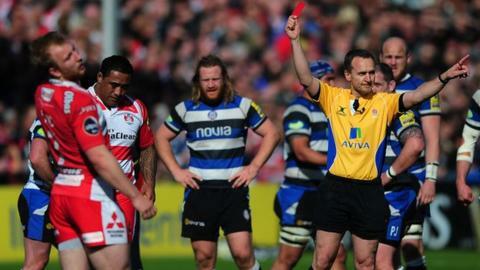 All five have escaped censure but retrospective yellow cards are to be issued to Bath pair Abendanon and Paul James. The Rugby Football Union is liaising with Gloucester over another incident during the match, in which an empty drinks bottle was thrown at Wigglesworth. The referee appeared to have been targeted as he walked down the tunnel while being escorted from the pitch after the final whistle. "I don't think anybody could look at it and say it was the greatest advert for the game, both in terms of the things that happened off and on the pitch," said RFU chief executive Ian Ritchie. Gloucester have investigated the bottle throwing and discovered the object was thrown from the seats occupied by a group of teenage boys on an escorted rugby tour. The club will take action pending further discussions.